Amish has taken the story of the Ramayana, added his own ideas, and created all kinds of twists. So, do not mistake it to be the great epic, Ramayana. It is a fictional retelling of it. 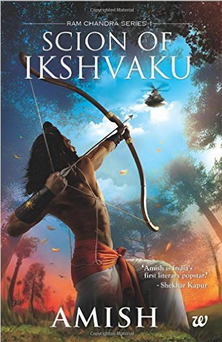 When I heard that it was a fictional retelling of the Ramayana, I got attracted to it. In the book, not all the characters are the way they are in the Ramayana. He has described some characters differently, so you might have to read that part again to understand it. One of his change in characters is when he has described Urmila. He has described the character of Urmila differently. I’ve read a few books on her, and they describe her to be a fiery, bold and brazen girl. In this book, he has described her be shy in nature. Note: This review contains a few minor spoilers. People who want the book to remain a mystery can skip over those parts. Warning: Minor spoilers ahead. Skip the next paragraph, if you want the book to remain a complete surprise. First, I’d like to start with describing to you a few changes in this story. One of the main surprises you will find is the difference in the relationship between Dasharatha and Ram. He has written that Dasharatha was not fond of Rama as he had gone to battle with Ravana the day Rama was born, and lost the battle. He took the child to be a bad omen and started intensely disliking the boy. This I thought Amish had taken a bit to the extreme. I liked most of his changes, but this one is not one that I cast a favourable eye upon. I don’t like it as he earlier in the book mentions that Dasharatha had wanted a child desperately. He married Kausalya, but she was not able to beget a child. He married Kaikeyi next, and finally Sumitra. He did all this so that he could get a son. When he did get one, he blamed the fact that he had lost a war on him! This is one of the things I have found slightly abrupt and strange. After this, the book has lots of twists and changes. The next thing I found interesting was the mysterious behavior of Rishi Vashishta. The Rishi is said to be straightforward and knowledgeable, and is not said to have been involved in any mysterious work. In this book, it is said that he is involved in something mysterious. I liked this, as it made the reader want to know what the great Rishi was involved in. I will only mention another change, or the book will no longer remain a mystery. The last thing I really enjoyed was the change in the behavior of Vishvamitra with Rama. It is said in Amish’s book, that Vishvamitra did not favour Rama at all! This was surprising, but this behavior of Vishvamitra towards Rama turned out to be crucial, judging the turn of events later mentioned in the book. I will also be giving you a small idea of the storyline. The story covers the birth of Rama, his marriage and it ends when they are in exile and Sita is abducted. It doesn’t go too much in detail with Rama’s childhood, but it does occasionally mention the pains that Rama had experienced during his childhood, by being neglected and ignored. Later everything is described in detail, as the rest of the book is extremely important. The book ends when Sita is abducted, and Rama sees the Pushpak Viman taking off with her. This is the first book, and the second book has been published too. Its title is ‘Sita, the Warrior Princess’. This book will talk about Sita and her life. This series may contain three or four books. This book is extremely well written. I never felt bored and am really excited to read the second book, and then will be awaiting the arrival of his third book in this series. I really liked Amish’s creativity and ideas. He added so many twists which made the story one which you will want to read. I found each change in the story unique. The start of the book is slow, but later you really start to enjoy it. You might have to read some parts of the book again to understand it. It is a worthwhile book to read. It describes many things in detail, making it simple for the reader to understand. It is very different from the Ramayana and has many things that have been changed, but it does not make it unpleasant to read. Even kids of ages 10 to 12 will find the book enjoyable, as it has mystery, adventure and all those categories that children of that age read and enjoy. I trust that you all enjoyed the review and will want to read the ‘Scion of Ikshavaku’, and its following books. The book was forced upon me by my father, who is constantly trying to pry me away from Harry Potter, and Narnia books, though he finds it very tough to. He gave me this book, hoping I would read it and help me give up my obsession over those books. I was not happy at first, but then I started to enjoy it.